Diarrhoea is one of those diseases that everyone has at least once during their lifetime. Most people with at least one episode per year. In fact, diarrhea is not a disease but a common manifestation of different diseases of the gastrointestinal tract. Technically diarrhea is evacuation of more than 200g of stool per day. No need to weigh the stool to know if you have diarrhea or not. The definition says that diarrhea is the evacuation of liquid or pasty stool performed more than three times per day. It is very easy to identify diarrhea, but why does it occur? Good, once again, to understand disease, it is necessary to understand the normal functioning, in this case, the digestive system (or digestion). How does works the digestive system? Digestion is different from absorption. Digestion is the process of breaking compounds in large molecules that are small enough to be absorbed. First the food is digested and then we can absorb them. If foods are not digested, the intestines can not absorb them, and they are eliminated in the feces. After ingestion of any food, it goes down the esophagus to the stomach. The stomach has three basic functions: to kill germs in food through its low pH (very acidic), break down large molecules into smaller molecules for subsequent absorption in other segments of the digestive tract and store food, releasing it into the duodenum processed foods in speed steady. When leaving the stomach, the food reaches the duodenum, the first part of the small intestine. 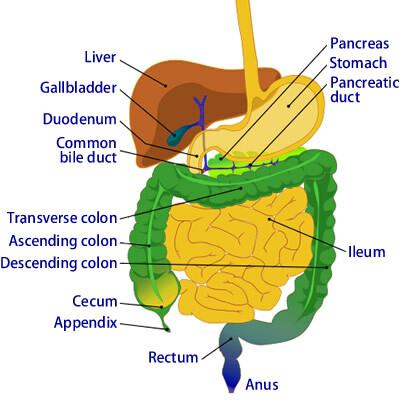 The duodenum receives secretions from the pancreas and gallbladder. The pancreas secretes pancreatic juice, a fluid rich in bicarbonate that helps to reduce the acidity of food from the stomach. Pancreatic juice is also rich in enzymes that are part of the digestion of proteins, carbohydrates and fats. The gallbladder produces bile, which is responsible for the coloring of stool and the digestion of fat, cholesterol and several vitamins (A, D, E and K). After the duodenum, the jejunum and ileum have the 2nd and 3rd parts respectively of small intestine. 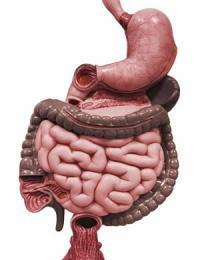 Jejunum and ileum form a major part of our digestive system and can reach 6 feet in length. This is the region where the greatest part of the absorption of food digests. The small intestine is responsible for the absorption of about 1 liter of water. Upon exiting the small intestine, any material that is not absorbed reaches the colon (large intestine). The colon is approximately 1.5 meters and is colonized by more than 700 species of bacteria that participate in the digestion of elements not yet digested, mainly fibers and polysaccharides (carbohydrates with complex molecules). This digestion performed by colonic bacteria is causing intestinal gas. However, the basic function of the large intestine is to reabsorb water in food content and eliminated in the secretions along the digestive tract, forming solid stool at the end of this process. The colon reabsorbs 19 liters of water per day. Stomach and duodenum, with the aid of the pancreas, gallbladder, digest the food. The small intestine (jejunum and ileum) absorb most of the nutrients digested and some water. The colon absorbs a large amount of water and digests part of nutrients. All that is not digested or absorbed goes to the exit end of the colon in the faeces. More than 200 types of germs, including viruses, bacteria and parasites can cause diarrhea presented by food poisoning. The diarrhea may be caused by the seed or toxins produced by them. The higher the concentration of toxins or microbes is, the greater is the chance of winning the acidity of the stomach and reaching the intestines. Some toxins after their production are not destroyed during cooking, so the storage of food must be done correctly before and after preparation. The sudden onset of nausea and vomiting, which may or may not be accompanied by diarrhea, less than 12 hours after ingestion of contaminated food (generally less than 6 hours), usually indicates intoxication preformed by enzymes. Bacteria do not cause toxicity themselves, it is enzymes that they produce and deposite in the feed. The toxins act primarily in the stomach, irritating the mucosa and causing vomiting. This type of food poisoning is usually caused by toxins of Staphylococcus aureus and Bacillus cereus. Another cause of food poisoning with vomiting is a virus called Norovirus. This virus can be transmitted through contaminated food or from person to person through aerosols as a cold. In the above three cases the disease is self-limiting with 3-4 days of life and needs no specific treatment in addition to hydration and drugs to alleviate the symptoms. The watery diarrhea caused by food poisoning is usually caused by damage to the mucosa of the small intestine by the bacteria themselves or by toxins produced only after ingestion of the germ. In this case the symptoms appear only after 24-48h after the ingestion of food. Various germs such as Cyclosporacayetanensis, Escherichia coli and Clostridium may be the cause. Viral infections are also causes watery diarrhea. There may be low-grade fever (less than 38 º C). It can affect many people with social contact (at work, school, etc.). Diarrhea can develop, but show no suspect of food intake in common, which it is typical of viral infections, which are transmitted in the same way that the influenza virus and cold. Bacteria and toxins act on the mucosa of the small intestine, increased secretions and accelerating the speed at which food passes. The small intestine is unable to digest and absorb food, which thereby gets a large amount of the colon. The volume of fluid and nutrients reaching the large intestine is great, preventing its absorption. Again, the case is usually self-limited lasting 3-4 days. You do not need any special treatment. The body itself is responsible for controlling the bacteria and heals the lining of the intestine. Cholera is an infection by a bacterium called Vibrio cholerae, which causes a severe watery diarrhea. 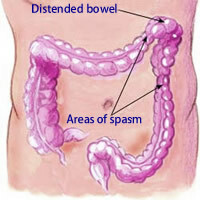 Patients may have more than 20 bowel movements per day and even lose up to 1 liter of water per hour. In more severe cases hospitalization is needed for intravenous hydration. The diarrhea that has blood, pus, mucus or associated with high fever should always be evaluated by a doctor. This picture is called inflammatory diarrhea or dysentery and can lead to sepsis or other serious complications. The inflammatory diarrhea is caused by bacteria such as Salmonella, Shigella, Campylobacter and enterohemorrhagic Escherichia coli, affecting the mucosa of the intestine. It may be necessary to treat it with antibiotics to control the infection. However, it is important to note that in cases of infection with Escherichia coli dare antibiotics can worsen diarrhea and promote the emergence of a serious condition called hemolytic uremic syndrome, which leads to anemia and severe renal impairment. Therefore, one should always perform stool culture to identify the causative agent and indicate the necessity of antibiotics. Never treat yourself with antibiotics in case of diarrhea. The use of antibiotics also wrongly indicated can cause complications, perpetuate diarrhea, and prevent the original bacterial flora of the intestine to grow again. Without the natural flora there is digestion of food in the colon and diarrhea does not stop. Another danger of antibiotics is the infection Clostridium difficile, bacteria that take advantage of the absence of normal bacterial flora to cause a severe inflammatory diarrhea. 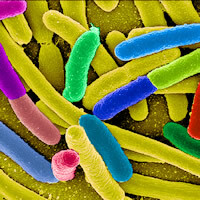 Clostridium difficile infection is the leading cause of diarrhea in patients and patients on antibiotics. Diarrhoea caused by Campylobacter bacteria is associated with the onset of Guillain-Barre syndrome. Any diarrhea with more than two weeks of evolution should raise suspicions about some disease of the intestinal tract that does not originate in food poisoning. Diarrhea with more than a month, which is considered chronic diarrhea and should always be investigated. All of the major causes of diarrhea are chronic inflammatory bowel diseases like Crohn's disease and ulcerative colitis, SIDA (AIDS), infection by amoebae and other parasites, tumors, and hyperthyroidism. The irritable bowel syndrome is a common cause of intermittent diarrhea and abdominal pain. There is no organic disease that warrants the frame. Usually the patient presents with diarrhea and cramps related to periods of emotional stress. Some patients have alternating diarrhea with constipation, others have small amount of mucus in the stool. Excess flatulence is also common. The irritable bowel syndrome is a benign disease and may have improved with some changes in diet and lifestyle. The presence of bloody diarrhea is not seen in irritable bowel syndrome. Their presence indicates the existence of another cause for diarrhea. There are some diseases of the intestines to prevent the absorption of nutrients, leading to diarrhea. A common example is lactose intolerance (dairy). It occurs due to a deficiency in the production of lactase, an enzyme that digests lactose in the small intestine. Another example is chronic pancreatitis, where the absence of pancreatic juice prevents the digestion of nutrients consumed. 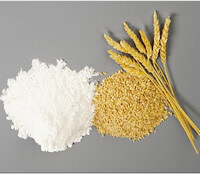 Celiac disease is caused by inability to absorb gluten, a protein in wheat and various other grains. The malabsorption syndrome can be also caused by parasites, such as giardiasis. As you can see, there are dozens of causes for diarrhea. Most cases are self limited, viriais caused by infections or food poisoning. When you should see a doctor because of diarrhea? If no signals above are present, diarrhea must be treated with generous fluid intake. The more intense diarrhea is, the greater will be the replacement of water. There are solutions for hydration in pharmacies, such as Pedialyte. One option is the oral rehydration which can be made from the addition of a teaspoon salt plus a tablespoon sugar in a container with 1 liter of boiling water and filtered. The use of medicines to stop diarrhea should be avoided at all costs. If there is a bacterium or toxin in the intestinal tract, it must be expelled from the body. The suspension of evacuation in infected patients can lead to severe sepsis. Remedies such as the famous Imodium (loperamide) should be used only by prescription. In most cases it is not indicated, it may worsen the infection. In most cases, it does not take any medicine for diarrhea. Just drink. If there is vomiting, medications may be used to control it. Medicines probiotics, such as Floratil (Saccharomyces boulardii) can help to reduce the time of diarrhea in some cases, but its benefit is much criticized. The patient do not have to fast when having diarrhea. In fact, the feeding aid to control diarrhea is the right way. Patients should only avoid fatty or milk based foods, as during an infection of the intestinal mucosa of small intestine is very swollen and unable to absorb nutrients complex. Soft drinks and Gatorade are not good for diarrhea because they contain lots of sugar. To reduce contamination, you should always wash your hands before preparing food or start meals. Patients with diarrhea should not prepare food for others until they are cured. My grandmother used to give me sweet tea if I had any problems with my stomach. She made me drink a lot of water and and never gave me food. I think this was the usual way of treatment diarrhea. But now doctors think that children should be fed. Times differ!